Liczba stron: 304 Jest to ujednolicona liczba stron, która ułatwi Ci porównanie długości książek. Każda strona Legimi to 200 słów. The Magister Udal sat in the room of his inn in Paris, where customarily the King of France lodged such envoys as came at his expense. He had been sent there to Latinise the letters that passed between Sir Thomas Wyatt and the King's Ministers of France, for he was esteemed the most learned man in these islands. 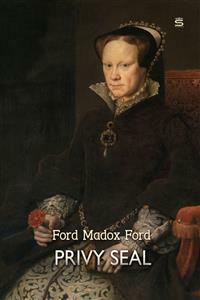 He had groaned much at being sent there, for he must leave in England so many loves—the great, blonde Margot Poins, that was maid to Katharine Howard; the tall, swaying Katharine Howard herself; Judge Cantre's wife that had fed him well; and two other women, with all of whom he had succeeded easily or succeeded in no wise at all. The Magister Udal sat in the room of his inn in Paris, where customarily the King of France lodged such envoys as came at his expense. He had been sent there to Latinise the letters that passed between Sir Thomas Wyatt and the King’s Ministers of France, for he was esteemed the most learned man in these islands. He had groaned much at being sent there, for he must leave in England so many loves—the great, blonde Margot Poins, that was maid to Katharine Howard; the tall, swaying Katharine Howard herself; Judge Cantre’s wife that had fed him well; and two other women, with all of whom he had succeeded easily or succeeded in no wise at all. But the mission was so well paid—with as many crowns the day as he had had groats for teaching the Lady Mary of England—that fain he had been to go. Moreover, it was by way of being a favour of Privy Seal’s. The magister had written for him a play in English; the rich post was the reward—and it was an ill thing, a thing the magister dreaded, to refuse the favours of Privy Seal. He consoled himself with the thought that the writing of letters in Latin might wash from his mouth the savour of the play he had written in the vulgar tongue. But his work in Paris was ended—for with the flight of Cardinal Pole, who had left Paris precipitately upon news that the King of England had sent a drunken roisterer to assassinate him, it was imagined that soon now more concord between Francis and England might ensue, and the magister sat in his room planning his voyage back to Dover. The room was great in size, panelled mostly in wood, lit with lampwicks that floated in oil dishes and heated with a sea-coal fire, for though it was April the magister was of a cold disposition of the hands and shins. The inn—of the Golden Astrolabe—was kept by an Englishwoman, a masterful widow with a broad face and a great mouth that smiled. She stood beside him there. Forty-seven she might have been, and she called herself the Widow Annot. The magister sat over his fire with his gown parted from his legs to warm his shins, but his hands waved angrily and his face was crestfallen. ‘That a hostess shall keep her tavern clean is writ in the books of the provost of Paris town,’ the Widow Annot answered, and the shadow of her great white hood, which she wore in the older English fashion, danced over the brown wooden beams of the ceiling. ‘No maid will wait upon thee,’ she answered. ‘Even thou thyself?’ he asked. He glanced across his shoulder and his eyes measured her, hers him. She had large shoulders, a high, full stomacher, and her cheeks were an apple-red. ‘The maiden was a fair piece,’ he tittered. ‘Therefore you must spoil the ring of the coin,’ she answered. They ate goat and green leeks sweetened with honey, and wood thrushes pickled in wine, and salt fish from the mouth of the Beauce. And because this gave the magister a great thirst he drank much of a warmed wine from Burgundy that the hostess brought herself. They sat, byside, on cushions on a couch before the warm fire. ‘Filia pulchra mater pulchrior!’ the magister muttered, and he cast his arms about her soft and plump waist. ‘The maid was a fair skewer, the hostess is a plumper roasting bit.’ She took his kisses on her fire-warmed cheeks, but in the end she thrust him mightily from her with a large elbow. ‘Greedy dogs getten them hard cuffs,’ and rearranged her neckercher. When he tried to come nearer her she laughed and thrust him aback. He stood before her, lean and lank, his gown flapping about his calves, his eyes smiling humorously, his lips twitching. Her face appeared comely and smooth in his eyes, but she shook her head at him. ‘All through the night,’ he said eagerly, and made to clasp her in his arms. But she pushed him back again with her hand on his chest. He sprang full four feet back at one spring. ‘I have wedded no woman, yet,’ he said. ‘Then it is time you wed one now,’ she answered. ‘You have done well this ten years without one,’ he cried out. Her face seemed to set like adamant as she turned her cheek to him. ‘Call it a woman’s mad freak,’ she said. He slipped himself softly into the cushions beside her. She held her face away from him and laughed. She continued to count the coins that came from his little money-bags; the shadow of her hood upon the great beams grew more portentous. ‘It is thought that your magistership may rise to be Chancellor of the Realm of England,’ she added. ‘Why, I will marry thee in the morning,’ he said, and he moistened his lips with the tip of his tongue. Outside the door there was a shuffling of several feet. ‘I knew not other guests were in the house,’ he uttered, and fell again to kissing her. ‘Knew you not an envoy was come from Cleves?’ she whispered. There was a great jangle, light fell into the dusky room through the doorhole, and he found himself beneath the eyes of many scullions with spits, cooks with carving forks, and kitchenmaids with sharpened distaffs of steel. ‘Now I will be wed this night,’ she laughed. He moved to the end of the couch and blinked at her in the strong light. ‘I will be wed this night,’ she said again, and rearranged her head-dress, revealing, as her sleeves fell open, her white, plump arms. ‘Why, no!’ he answered irresolutely. They moved towards him, a white-clad body with their pointed things glittering in the light of torches. He sprang behind the great table against the window and seized the heavy-leaden sandarach. The French scullions knew, tho’ he had no French, that he would cleave one of their skulls, and they stood, a knot of seven—four men and three maids—in blue hoods, in the centre of the room. ‘I am even trapped?’ he asked. ‘So it comes to all foxes that too long seek for capons,’ she answered. ‘But consider,’ he said. He sat himself by the fireside upon a stool, being minded to avoid temptation. ‘I would have your magistership forget the rogues that be without,’ she said. ‘They were a nightmare’s tale,’ he said. He tilted his stool forward. ‘No; no, I swear it,’ he said eagerly. ‘No; not one half so bounteous is her form,’ he answered, and moved across to the couch. ‘Then if you can bear her weight up you can bear mine,’ she said, and moved away from him. ‘Nay,’ he answered. ‘She would help me on,’ and he fumbled in the shadows for her hand. She drew herself together into a small space. ‘You affect her more than me,’ she said, with a swift motion simulating jealousy. ‘By the breasts of Venus, no!’ he answered. She gurgled ‘oh’s’ of pleasure. He fingered her soft palm and rubbed it across his own neck. ‘Why with her more than with me or any other of your score and seven?’ she said softly. ‘Since the Lady Katharine will be Queen,’ he answered, and once again he was close against her side. She sighed softly. ‘Thus if you wed with me you will never be Chancellor,’ she said. ‘I would not anger the Queen,’ he answered. She nestled bountifully and warmly against him. ‘Swear even again that you like me more than the fair, large wench in London town,’ she whispered against his ear. She murmured ‘Oh, oh,’ and placed her arms around his shoulders. She moved herself a little from him in the darkness. He sought to draw her to him, but she stiffened herself a little. His hands moved tremblingly towards her in the darkness. A hiss of exasperation came upon his lips, for she had slipped from beneath his hands into the darkness. ‘Why, then, I will not stay your climbing,’ she said. ‘Good-night,’ and in the darkness he heard her sob. The couch fell backwards as he swore and sprang towards her voice. ‘Ho là! Apportez le prestre!’ she softened herself in his arms. He considered of the fair and resentful Margot Poins whom it was incumbent indeed that he should wed: that Katharine Howard loved her well and was in these matters strait-laced. When his eyes measured his wife he licked his lips; when his eyes were on the floor his jaw fell. At best the new Mistress Udal would be in Paris. He looked at the rope tied round the thin middle of the brown priest, and suddenly he leered and cast off his cloak. ‘Let me remember to keep an equal mind in these hard matters,’ he quoted, and fell to laughing. For he remembered that in England no marriage by a friar or monk held good in those years. Therefore he was the winner. And the long, square room, with the cave bed behind its shutter in the hollow of the wall, the light-coloured, square beams, and the foaming basin of bride-ale that a fat-armed girl in a blue kerseymere gown served out to scullion after scullion; the open windows from which a little knave was casting bride-pennies to some screaming beggars and women in the street; the blind hornman whose unseeing eyes glanced along the reed of his bassoon that he played before the open door; the two saucy maids striving to wrest the bride’s stockings one from the other—all these things appeared friendly and jovial in his eyes. So that, when one of the maids, wresting the stocking, fell hard against him, he clasped her in his arms and kissed her till she struggled from him to drink a mug of bride-ale. ‘Hodie mihi: mihi atque cras!’ he said. For it was in his mind a goodly thing to pay a usuress with base coins. The magister, happy with a bellyful of carp, bread and breakfast ale, muttered ‘Anan?’ from above his copy of Lucretius. He sat in the window-seat of the great stone kitchen. Upon one long iron spit before the fire fourteen trussed capons turned in unison; the wooden shoes of the basting-maid clattered industriously; and from the chimney came the clank of the invisible smoke-vanes and the be-sooted chains. The magister, who loved above all things warmth, a full stomach, a comfortable woman and a good book, had all these things; he was well minded to stay in Paris town for fourteen days, when they were to slay a brown pig from the Ardennes, against whose death he had written an elegy in Sapphics. ‘I am minded that ye shall travel far erstwhile,’ she answered. He laid down his book upon a clean chopping-board. ‘I know a good harbourage,’ he said. She sat down beside him in the window and fingered the fur on his long gown, saying that, in this light, it showed ill-favouredly worm-eaten; and he answered that he never had wishes nor money for gowning himself, who cultivated the muses upon short commons. She turned rightway to the front the medal upon his chest, and folded her arms. ‘Let us love to-day that’s here,’ he said. ‘I will read thee a verse from Lucretius, and you shall tell me the history of that fourth capon’—he pointed to a browned carcase that, upon the spit, whirled its elbows a full third longer than any of the line. He considered the chicken with his head to one side. ‘It is the place of a wife to be subject to her lord,’ he said. ‘It is the place of a husband that he fendeth for ‘s wife,’ she answered him. She tapped her fingers determinedly upon her elbows. He considered for five seconds, his elbow upon his crossed knees and his wrist supporting his lean brown face. He wriggled a little beneath his furs. She laughed a little, and, with a great knife, cut a large manchet from the loaf between them. He grinned with his lips. She was fair and fat beneath her hood, but she was resolute. ‘I have it in me greatly to advance you,’ she said. A boy brought her a trencher filled with chopped things, and a man in a blue jerkin came to her side bearing a middling pig, seared to a pale clear pinkness. The boy held the slit stomach carefully apart, and she lined it with slices of bread, dropping into the hollow chives, nutmegs, lumps of salt, the buds of bergamot, and marigold seeds with their acrid perfume, and balls of honied suet. She bound round it a fair linen cloth that she stitched with a great bone needle. ‘Goes it into my wallet?’ he asked joyfully. ‘You speak in hard riddles,’ he uttered. He leaned towards her earnestly. ‘You are, even as I have heard it said, a spy of Thomas Cromwell?’ she asked in return. He looked suddenly abashed, but she held to her question. ‘I pass for Privy Seal’s man,’ he answered at last. ‘But you have played him false,’ she said. He grew pale, glanced over his shoulder, and put his finger on his lips. ‘I’ll wager it was for a woman,’ she accused him. She wiped her lips with her apron and dropped her hands upon her lap. ‘Why, keep troth to Cromwell if you can,’ she said. ‘I do think his sun sets,’ he whispered. He was still a little shaken at the thought of Privy Seal. ‘But is no woman from Cleves’ Queen there now?’ she asked. His wife slipped down from her seat. ‘Gave I you not the ostler’s gossip from Calais three days since?’ she said, and went towards her roastings. ‘But wherefore comes the yellow dog to Paris?’ Udal persisted. Udal too slipped down from the window-seat; he buttoned his gown down to his shins, pulled his hat over his ears and hurried through the galleried courtyard into the comfortless shadows of the street. There was no doubt that Norfolk was coming; round the tiny crack that, two houses away, served for all the space that the road had between the towering housefronts, two men in scarlet and yellow, with leopards and lions and fleurs-de-lis on their chests, walked between two in white, tabarded with the great lilies of France. They crushed round the corner, for there was scarce space for four men abreast; behind them squeezed men in purple with the Howard knot, bearing pikes, and men in mustard yellow with the eagle’s wing and ship badge of the Provost of Paris. In the broader space before the arch of Udal’s courtyard they stayed to wait for the horsemen to disentangle themselves from the alley; the Englishmen looked glumly at the tall housefronts; the French loosened the mouthplates of their helmets to breathe the air for a minute. Hostlers, packmen and pedlars began to fill the space behind Udal, and he heard his wife’s voice calling shrilly to a cook who had run across the yard. The crowd a little shielded him from the draught which came through the arch, and he waited with more contentment. Undoubtedly there was Norfolk upon a great yellow horse, so high that it made his bonnet almost touch the overhanging storey of the third house; behind him the white and gold litter of the provost, who, having three weeks before broken his leg at tennis-play, was still unable to sit in a saddle. The duke rode as if implacably rigid, his yellow, long face set, listening as if with a sour deafness to something that the provost from below called to him with a great, laughing voice. The provost’s litter, too, came up alongside the duke’s horse in the open space, then they all moved forward at the slow processional: three steps and a halt for the trumpets to blow a tucket; three more and another tucket; the great yellow horse stepping high and casting up his head, from which flew many flakes of white foam. With its slow, regularly interrupted gait, dominated by the impassive yellow face of Norfolk, the whole band had an air of performing a solemn dance, and Udal shivered for a long time, till amidst the train of mules bearing leathern sacks, cupboards, chests and commodes, he saw come riding a familiar figure in a scholar’s gown—the young pedagogue and companion of the Earl of Surrey. He was a fair, bearded youth with blue eyes, riding a restless colt that embroiled itself and plunged amongst the mules’ legs. The young man leaned forward in the saddle and craned to avoid a clothes chest. Longstaffe slipped from his horse, which he left to be rescued by whom it might from amongst the hard-angled cases. ‘Assuredly,’ he said, ‘there is no love between that beast and me as there was betwixt his lord and Bucephalus,’ and he followed Udal into the galleried courtyard, where their two gowned figures alone sought shelter from the March showers. ‘But your mission?’ Udal asked. The doctor, his hard blue eyes spinning with sardonic humour beneath his black beretta, said that his mission, even as Udal’s had been, was to gain some crowns by setting into the learned language letters that should pass between his ambassador and the King’s men of France. Udal grinned disconcertedly. The hostess received him with a bridling favour, rubbing her cheek pleasantly, whilst Udal was seeking to persuade himself that, since the woman was in law no wife of his, he had no need to fear. Nevertheless rage tore him when the doctor, leaning his back against the window-side, talked to the woman. She stood between them holding a pewter flagon of mulled hypocras upon a salver of burnished pewter. The doctor surveyed his perturbation with cross-legged calmness. The doctor’s blue eyes shot a hard glance at her, and he let his head sink down. ‘Then these rave upon her as doth the magister?’ she asked. ‘I be wed,’ she answered pleasantly. The magister, torn between his unaccustomed gust of jealousy and the desire to hide his marriage from a disastrous discovery in England, clutched with straining fingers at his gown. ‘Tell wherefore cometh your mission,’ he said. ‘It is true, then, that she shall be queen?’ Udal’s wife asked. The fall of a great dish in the rear of the tall kitchen gave the scholar time to collect his suspicions—for he took it for an easy thing that this woman, if she were Udal’s leman, might be, she too, a spy in the service of Privy Seal. Panic rose in the heart of the doctor; he beheld himself there, in what seemed a spy’s kitchen, asked disastrous questions by a man and woman and pinned into a window-seat. For there was no doubt that the rumour ran in England that this mission had been sent by the King because Katharine Howard so wished it sent. In that age of spies and treacheries no man’s head was safe on his shoulders—and here were Cromwell’s spies asking news of Cromwell’s chief enemy.